Jadeite – transparent to opaque in green and other colors. Nephrite – opaque usually green or white. These minerals are very hard to distinguish from one another. Jadeite is the rarer of the two. 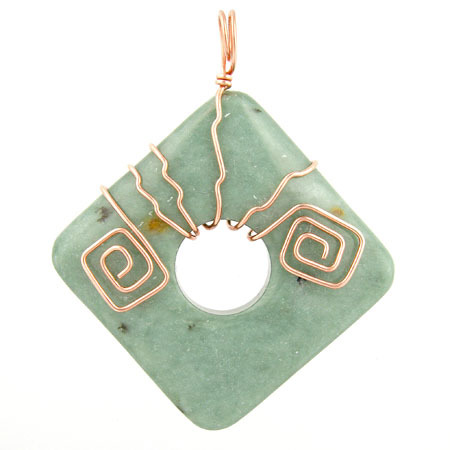 According to archeologists, the Chinese have been using jade since about 10,000 B.C. They believed it was the essence of heaven and earth and carved into birds and beasts which were used as items of worship. Confucius concluded jade had 11 virtues, including benevolence, fidelity, etiquette, wisdom and sincerity. Jade was not only a decoration, but also a symbol of ethics and behavior. The Chinese even consumed powdered jade as a remedy for just about every ailment known, and drank it at the time of death as a powerful embalming solution. The indigenous peoples of Central America also treasured jaded and used it in carvings and masks. The Aztecs even instituted a tax on jade. Most Europeans were unfamiliar with jade until decorative objects were imported from China in the 16th Century. The Portuguese brought jade home from their settlement in China. The Spanish brought it home from their explorations in the New World. Jade is a symbol of purity and serenity. It is believed to attract luck and good fortune. Jade is also thought to guard against accidents and misfortune. And to make things even more interesting, African Jade is, in most cases, grossular garnet. Jasper is a wonderful gemstone of seemingly endless variety and it is one of the more common of the world's gemstones. Its name comes from the Greek iaspis for "spotted stone." Jasper is a member of the chalcedony (pronounced kal-SEH-doh-nee) or microcrystalline branch of the quartz family. Another familiar member of this branch of the quartz family is agate which is usually translucent or has translucent bands whereas jasper is usually opaque. Jaspers come in shades of brown, red, rust, and green with amazing patterns. The colors and patterns are the result of the minerals present in the stone. Jaspers are frequently named after their patterns. 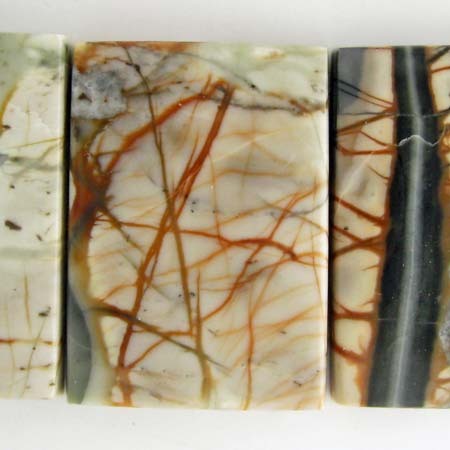 The specific patterns and colors of jasper are described separately below. In general, jasper is supposed to give you courage to speak out. Some use it to drive away evil spirits. Care: Wipe with a soft, clean cloth. Using water could dull its polish. 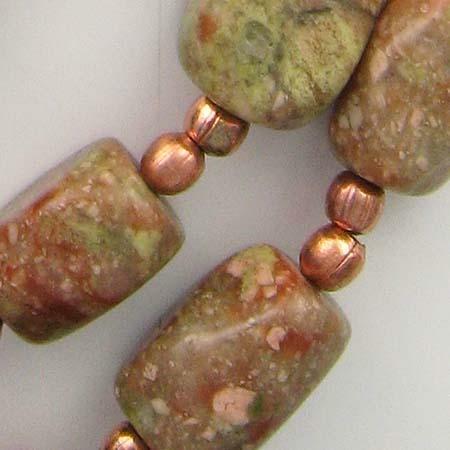 ​Autumn jasper is a mix of all the wonderful colors of fall - rust, green, brown, and red. It is thought to help one with plans for the future and to prevent procrastination. "Brecciated" comes from "breccia"--a geology term used to identify rock composed of broken fragments cemented together into a fine-grained matrix. Brecciated jasper is made when the earth melds sharp-angled fragments of stone together. 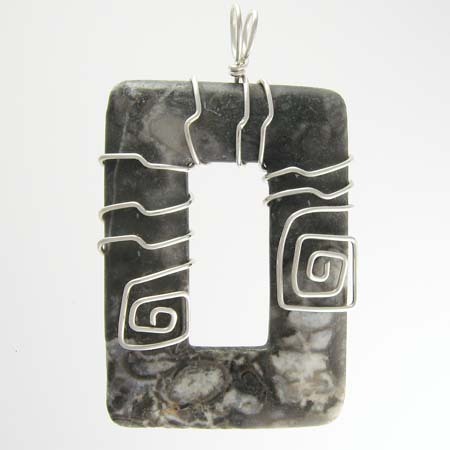 ​This jasper has bold patterns which make it stunning as a focal piece. ​Brecciated jasper is thought to provide mental clarity and focus its wearer. Chocolate jasper comes in every shade of brown from milk to dark chocolate often with stripes of each color in one stone. Brown jaspers are said to bring stability and balance. 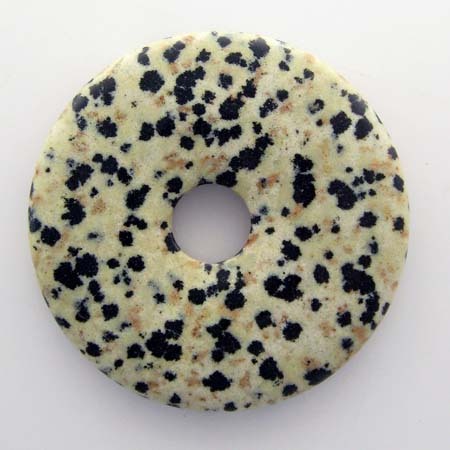 ​Dalmatian jasper has a cream background with blank and/or brown spots - just like the dog of the same name. It is supposed to increase patience and to lift our mood. it's also said to protect against nightmares, depression and negative thinking. 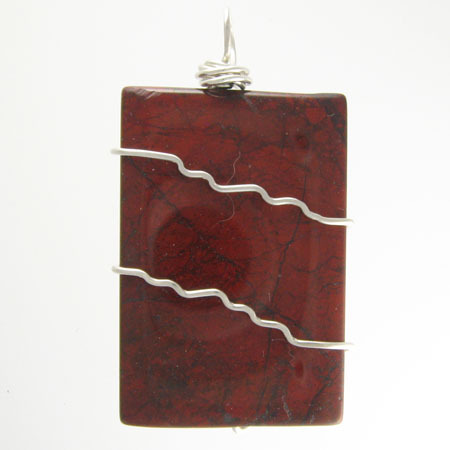 ​Fire jasper has earthy shades of red, terra cotta, gray and brown. It’s the perfect embodiment of fall colors. 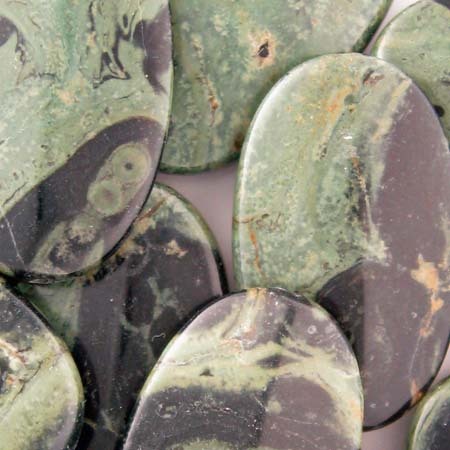 ​Kambaba jasper is a combination of light and dark green, brown, and black in concentric circles and speckles. This stone is sometimes called "brecciated army jasper" or "camo stone." Mystics believe kambaba jasper soothes the nerves. ​Mexican zebra jasper has bold black and white strips like its namesake. 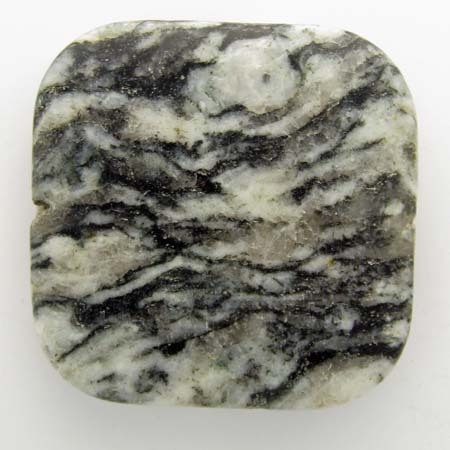 This stone is also known as "black and white zebra jasper." 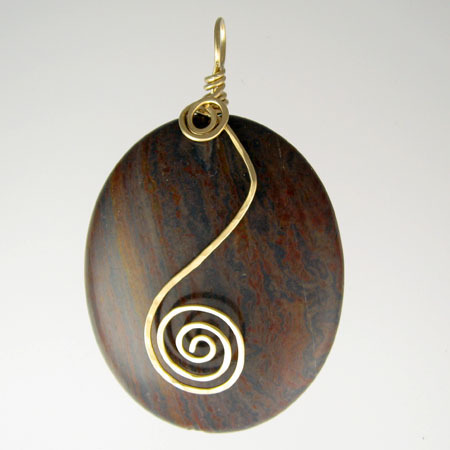 Mexican zebra jasper is said to help the wearer see both sides of a situation. 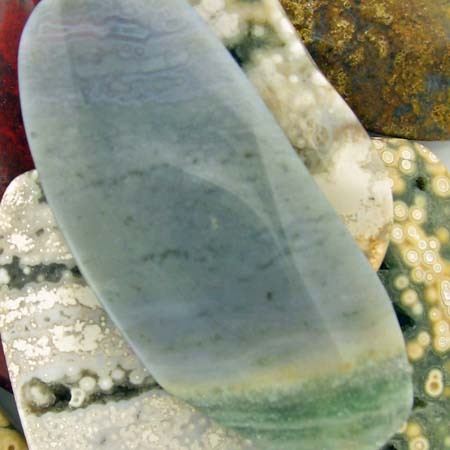 ​Ocean jasper has wavy and circular patterns in green, cream, beige, brown, and pink. It sometimes looks like the foam from a wave that just broke on the beach. It is one of my favorite jaspers. Ocean jasper is also knows as "orbicular jasper" and "fisheye jasper." Ocean jasper is said to be a very calming and soothing stone. 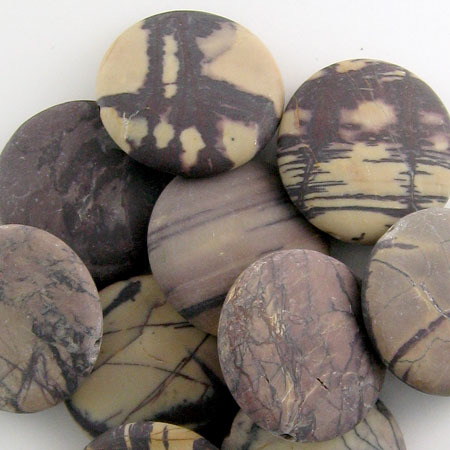 ​Picasso jasper contains abstract patterns of green, brown, red, black, and/or gray. The patterns resemble angular abstract brushstrokes and have a modernistic look. Picasso jasper is believed to inspire creativity. 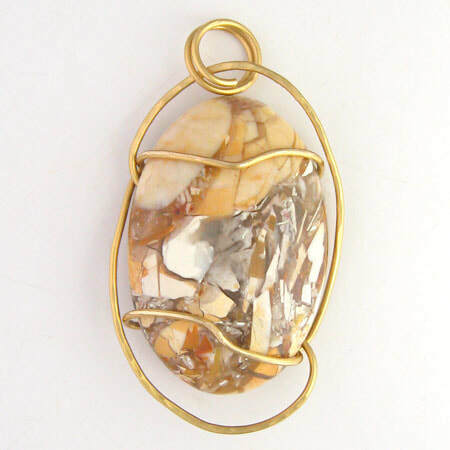 ​Picture jasper often looks like a landscape painting, perhaps a desert or mountain scene. It is formed from petrified mud and quartz. Picture jasper is believed to help one re-evaluate life's issues. It is also said to facilitate business pursuits. ​Purple creek jasper has a lovely combination of shades of purple, tan, brown, gray and black. Often it has a matte finish which gives it the look of rich suede. 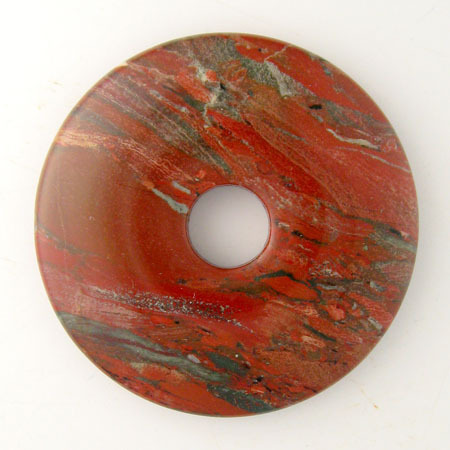 Red jasper is a deep brick red with occasional bark gray stripes. It is said to promote physical stamina and makes an excellent "worry bead." Jewel Brite Professional Jewelry Cleaner and Biodegradable Tarnish Remover are the two products I use to keep all my metal jewelry sparkling. The Professional Jewelry Cleaner is a liquid which I keep in a small glass jaw. I simply place lightly tarnished pieces in the jar, swish them around and before you know it they look like new. For more heavily tarnished items, I leave them soak in the cleaner for a couple of hours or overnight. I use a battery operated tooth brush to get the solution into tiny crevices. For those black pieces of sterling silver, I use the Biodegradable Tarnish Remover which is a paste. I put a little of the paste on a wet battery powered toothbrush and scrub away the tarnish. I’ve used both the Cleaner and the Tarnish remover with jewelry made of a variety of gemstones including pearls, coral and turquoise without any problems. But, if you use either product, please be sure to read the accompanying instructions.